by Newt Gingrich: What if Hillary Clinton had defeated President Trump in 2016? What if Steve Jobs had given up and the iPhone had never been marketed? What if President John F. Kennedy had decided racing Russia to the Moon was too risky or too expensive? In each case, the world today would be dramatically different. In my Facebook series, “What If? History That Could’ve Been,” which is currently in its second season, I explore ideas like these. While it is creative and fun to describe alternative histories, it also serves a useful purpose. It moves us from simply memorizing facts to really thinking about them. It is a way to study history dynamically, rather than statically. Many people grow to dislike studying history because they are taught a dry, boring, fact memorization system that feels dead and sterile – and provides no meaning or context for our lives. Yet, when history is studied actively, it is dynamic, alive, and teaches a lot about our decisions, our own lives, and today’s challenges. If Wellington’s defeat of Napoleon (a decisive moment for modern Europe) was that close of a battle, it could have gone the other way. Therefore, it is totally appropriate to ask what would have happened if Napoleon had been triumphant and the British and Prussian armies had been defeated? What would Europe look like today? Similarly, the Battle of New Orleans made Major General Andrew Jackson a hero and set the stage for his ultimate election to the presidency. Yet, this decisive battle was fought on January 8, 1815 – two weeks after the War of 1812 officially ended with the signing of the Treaty of Ghent on Christmas Eve in 1814. However, because intercontinental communication required sailing ships, word had not yet reached New Orleans when the British attacked and Jackson’s American soldiers defeated them. 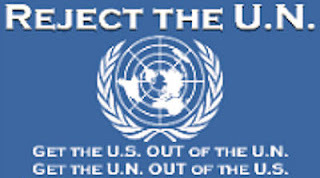 What might have happened to Jackson’s national fame if word of the peace treaty had reached the British by January 7? This pattern of actively exploring alternative outcomes leads to a much deeper understanding of the moving parts in history. It leads to a better sense of what we should be thinking about when we make decisions. It teaches us to look for the linkage points between different patterns. For some reason, I have always thought dynamically about historic experiences. It may have come from growing up as an Army brat and living in then-war-torn places like Orléans, France and Stuttgart, Germany. In the late 1950s and early 1960s, in both cities, you could still see the bombing damage caused during World War II, which served as a vivid reminder of the consequences of history. Orléans also has a huge statue of Joan of Arc. It is easy, almost inevitable, to marvel at this young woman who emerged at age 17 to save the French monarchy, only to be burned at the stake at 19 by her English enemies. For over a year, I went to school near this remarkable statue and was reminded again and again how improbable events and extraordinary people can change the direction of history. Another event which got me thinking about how history can shift suddenly was the fall of the Fourth Republic in France and the return of General Charles de Gaulle from retirement. De Gaulle was a great example of how a unique personality can shape history. He had played a role in developing armored warfare in the 1930s, then had led the Free French movement from London after the fall of France in 1940. Then, he organized the post-war government and served briefly as provisional president before resigning in disgust at the politicians he despised. For years, before he (briefly) retired to his home at Colombey-les-deux-Églises to write his memoirs, he worked on sustaining a nationalist movement that seemed doomed to irrelevancy as the traditional politicians ignored de Gaulle and played musical chairs with various government positions. But all of this changed very quickly. When I was a teenager, we were living in France as the Fourth Republic was toppled, de Gaulle was brought out of retirement and back to power, and the Fifth Republic was invented. Watching de Gaulle maneuver, educate the public, undertake bold reforms, and take on bitter opponents was an amazing experience. Today, due to de Gaulle’s work, President Emmanuel Macron is leading one of the longest surviving non-monarchy governments in French history. My years in Europe where my father was serving in the Army convinced me that history has an impact on all of us. It also convinced me that strong, determined people can have a remarkable impact on history. I started my Facebook series because I believe in the power of asking “What If?” If you start exploring what could have been, you will find yourself much more deeply engaged in studying and learning from history. Your own imagination will be enriched and your ability to solve problems will be expanded. In the first few months of the “What If?” series, more than 58,000 people have subscribed to the show on Facebook and hundreds have sent in their own wish lists for topics for us to explore in future episodes. So far, our most-watched episode, “What if Hillary had won?,” has had more than 2 million views and 27,000 shares. Doing this show has also given me the opportunity to expand my own understanding of history. After posting an episode on what might have happened if Senator Robert F. Kennedy had not been assassinated in 1968, Judge James Rogan, who I worked with in Congress and is now a judge in the Superior Court of California, emailed me to inform me that I was “about 95 percent correct” in my assessment. On To Chicago: Rediscovering Robert F. Kennedy and the Lost Campaign of 1968. Rogan’s take during our conversation was educational for me, and I look forward to reading his book when it comes out on May 15. This has been very encouraging for me because understanding our history is critical to creating a strong, successful future. 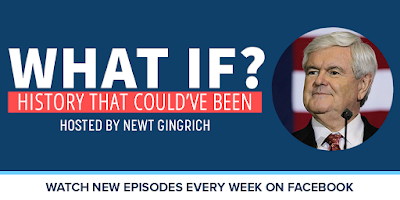 I hope you enjoy the “What If?” episodes as much as I enjoy sharing them. You can follow the show on Facebook and submit your episode ideas here. 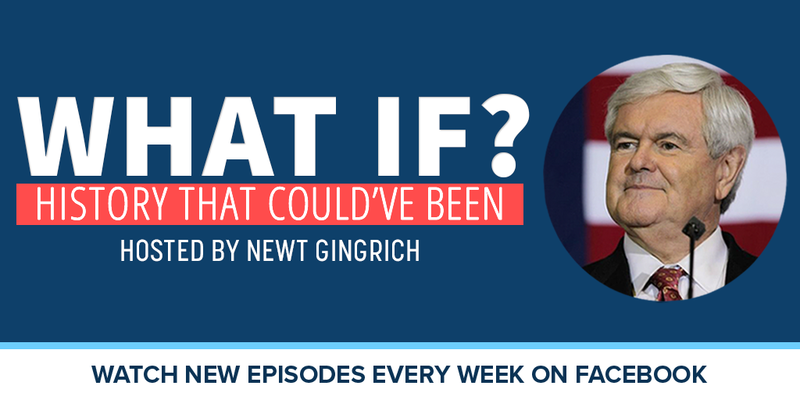 Tags: Newt Gingrich, commentary, What If? History That Could’ve Been To share or post to your site, click on "Post Link". Please mention / link to the ARRA News Service and "Like" Facebook Page - Thanks!